In a college curriculum, classes numbered 101 are “survey” courses designed to introduce students to a subject area and entice them to study further in the field. 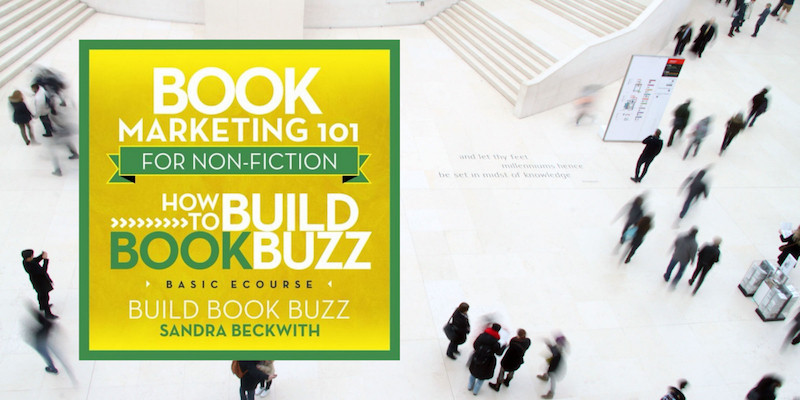 In that sense, Sandra Beckwith’s Book Marketing 101 fits the bill perfectly. As a nonfiction writer, I reviewed the Nonfiction version of the course; I assume that the Fiction variety is similarly strong. The course has four main sections, each of which contains several short lessons. Aside from a welcome video, the lessons are all text-based, so you can take them at your own pace and skip around as needed. Announcing your book. This section includes lessons on creating a press kit and getting book reviews. Working with the press. These lessons offer advice for pitching your book and expertise to the media. Promoting your book online. Multiple short lessons cover virtual book tours, Amazon, and various social media channels. Using your voice. This section offers advice on pursuing public speaking and podcasting opportunities. The course includes a book marketing template to create your own, customized book marketing plan. In the assignments, Beckwith encourages you to take what you’re learning and flesh out your own marketing plan. This alone is worth the price of admission for many authors. Sandra’s expertise really shines in the advice in the sections on working with the press and speaking. And if I’m ever asked to do a television interview, you can bet that I’ll pop back to that lesson! In short, this is a terrific survey of many traditional book publishing techniques – and specifically the practices around building “buzz” with the help of media. I’ll refer back to it in the future. I love Sandra’s stuff as well, Anne. thanks for the review.